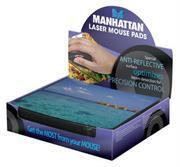 Manhattan XL Gaming Mousepad - Smooth Waterproof Top Surface, Stitched Edges, Black, Retail Box , No warranty. The Manhattan XL Gaming Mousepad meets the demands of gaming, one of the most popular pastimes in the modern world. This water-proof mousepad provides the smooth physical space necessary for high-speed, precision movements during intense gaming sessions. Its non-slip base ensures a stationary surface for a vigorously moving mouse to win battles, fight bosses, rescue team members and more. 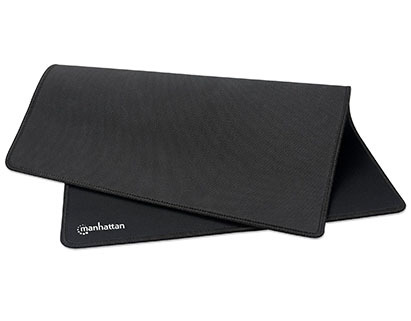 The Manhattan XL Gaming Mousepad is compatible with all common mouse types (e.g., ball, optical and laser). With a surface area of nearly 0.13 square meters, the Manhattan XL Gaming Mousepad gives you the material to bring your gaming experience to whole new levels of fun. Helps reduce wrist fatigue and improves mouse performance. The MANHATTAN Ergonomic Gel Mouse Pad with built-in, gel-filled wrist support conforms to promote proper working positions to reduce wrist fatigue, stress and repetitive motion disorders. A specially textured surface helps optimize optical and laser beam detection for definitive mouse pointer location and minimized cursor fade or jitter. Durable, synthetic materials provide a non-slip grip that protects desktops from scratches and excessive wear, and a low-friction surface provides smooth movement for comfortable, long use with less effort. Ideal for recovering from a previous injury or preventing harm in the home or office, the MANHATTAN Ergonomic Gel Mouse Pad helps graphic designers, digital art and photography enthusiasts, CAD/CAM operators and others get the most from high-performance computer mice without compromising health or productivity.